Marketplaces such as TheFind, Google Products and Amazon help you sell you products using either cost per click or cost per sale models. By default Store Manager will send your entire product catalog to these marketplaces. However, you may want to limit what products are being sent to these marketplaces due to a variety of reasons. For example, you might be less profitable with a certain vendor and therefore do not want to sell their products on the marketplace. Or a vendor may restrict you from selling on a marketplace such as Amazon. Finally, maybe some of your product categories do not meet some sort of requirement from the marketplace and you can't send them at all. 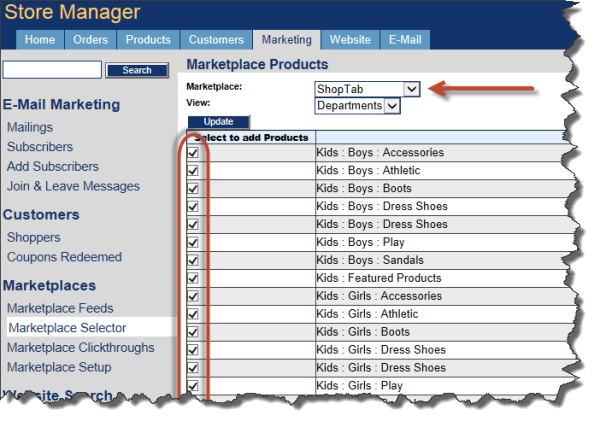 Luckily, Store Manager has a built-in feature called Marketplace Selector that allows you specify which Department and Categories should not be sent to a marketplace. Under Marketing > Marketplaces you will find a page called Marketplace Selector. This page allows you to specify which Departments or Categories to exclude from a particular marketplace. 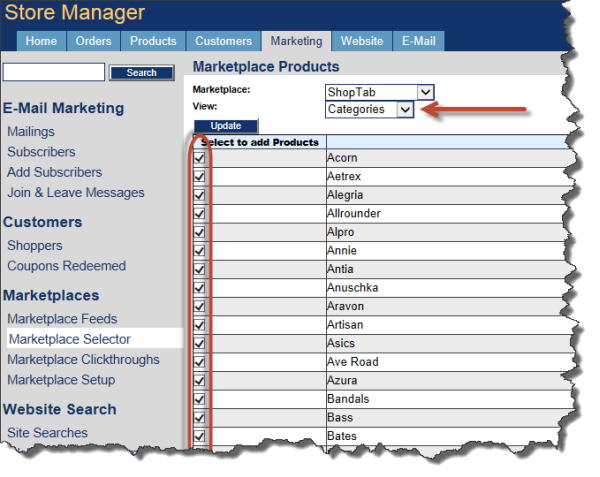 To exclude a Department first pick the Marketplace from the dropdown box at the top of the page and then simply uncheck the box in front of the Department to exclude. You can do the same thing with Categories, which are most likely your designer or brands, by selecting Categories from the second dropdown menu. Excluding Departments or Categories from marketplaces allows you to send only those products you want, while excluding those products you don't want sent.